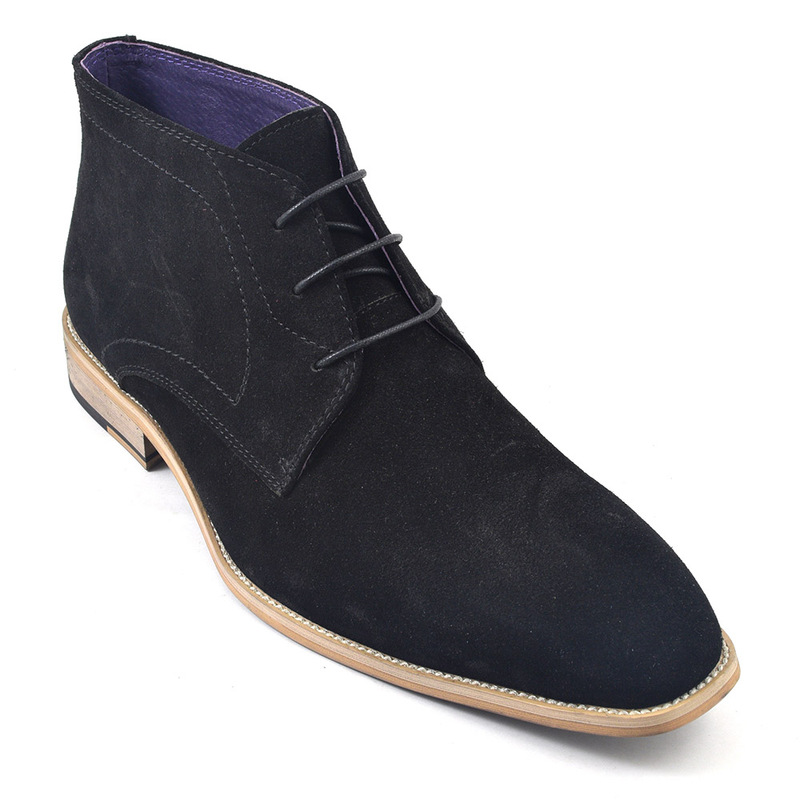 A black suede chukka boot which is simple in design and can be worn either formally or casually making it versatile. The upper is in a suede and there is exposed stitching to the outer sole which adds personality. 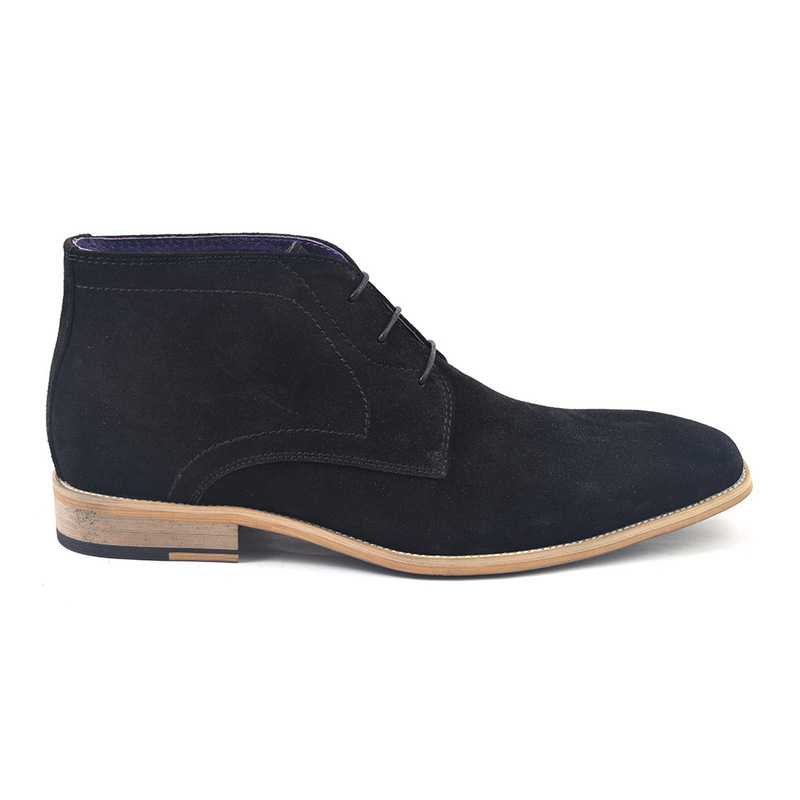 Grab a pair of mens black suede chukka boots for a play between a formal and casual look. The main character of a chukka boot is that it is ankle length, with two to three eyelets in an open lace system, in suede and with a round toe. The birth of this casual mens suede boot is found in the game of Polo as the word chukka denotes a period of play in the game. The hindi word ‘chukkar’ means circle as well as to have a leisurely walk and polo players often slipped into their suede chukka boots after a game to do just that. There are links to the British Army as they were worn by officers in India and subsequently by the Duke of Windsor. 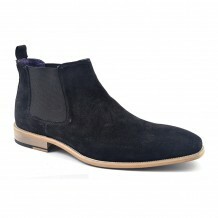 A form of these were also worn in WW II in a desert campaign and hence became known as desert boots. These had a crepe sole where as a chukka would normally have a thin leather sole making them a much more causal affair. 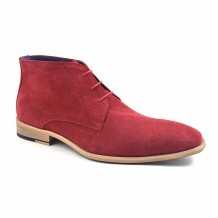 The suede chukka boot became celebrated in the 40s and 50s as they married comfort and style beautifully. This particular black suede chukka boot for men does just that too. It has an elegant last on a thin heel which means it can be worn with certain suits. Of course, it has that relaxed feel with the lovely texture of suede so you can dress casually and maybe try a pair of funky socks to create a fun vibe to your outfit. Remember suede needs to breathe and doesn’t like the light so keep them in a cool dark place preferably with a shoe tree and you will have a black suede boot which may just be the most versatile shoe in your collection. 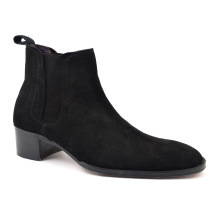 Be the first to review “Huba Black Suede Chukka” Click here to cancel reply.